Our History Page is currently under construction. In the near future, we plan to present a written record of our Chapter. We appreciate your patience as we construct a quality site for our members and the general public. 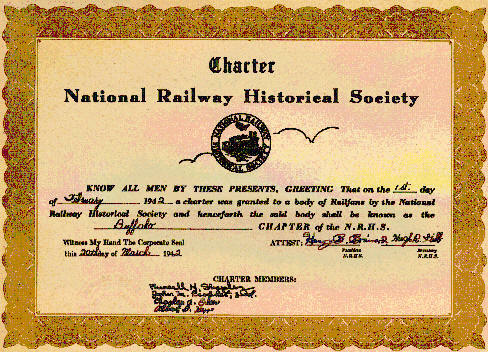 In 1986, Buffalo Chapter of the National Railway Historical Society published a scrap book entitled "History of Buffalo Chapter National Railway Historical Society - 1938 to 1974" by Harold J. Ahlstrom - Chapter Historian. The following excerpts are based on this publication - Copyright 1986 by the Buffalo Chapter (renamed the Niagara Frontier Chapter NRHS Inc). The strong leader and founder of the Buffalo Chapter, and for many years until his death in 1946, was Russell H. Shapely. John Prophet III, charter member, is the source of information for this page. Mr.Shapely convened a meeting at his home on April 8, 1938 of people he knew might be interested. Russell at this time had a job as collector for a credit clothing store and covered the east and south sides of the Buffalo area. Here he found former and present railroad men, or men who were just interested in railroads. At this first meeting a group of 16 people formed a division of the Railroad Enthusiasts, a national railfan organization. Meetings were held every week at his home and in May of that year a trip was run on the New York Central to Cleveland. The Central had an excursion fare every week and created a lot of publicity for these trips. Through the efforts of Russ, two extra cars were attached to the regular train out of Buffalo. these being taken off at the Collingwood Shops were an inspection was held. Later, an electric engine took these cars into Cleveland. With the help of the railroad, the 16 founding members ended up with about 70 passengers on this first fantrip of the Chapter. This started a schedule of monthly trips. In June they operated a special train on the Arcade and Attica Railroad. In July, via New York Central to Westfield with chartered cars on the Jamestown Westfield and Northwestern interurban line. August saw special cars on the Niagara, St. Catherines, and Toronto interurban system, and October special cars on the Pennsylvania Railroad day train to Emporium and return. In May 1939 the Collingwood trip was repeated. Also in 1939, Albert D. Kerr. Charles Erler, Lawrence Burke. and Harold Ahlstrom appeared on the chapter fan trips, joining the chapter in 1939 and 1940.